Join the Pick Museum of Anthropology now through February, as it partners with five local organizations to raise awareness of needs in the local community: Huskie Food Pantry, Hope Haven of DeKalb County, Inc., Safe Passage, Inc., Family Service Agency of DeKalb County, and American Indian Center – Chicago. 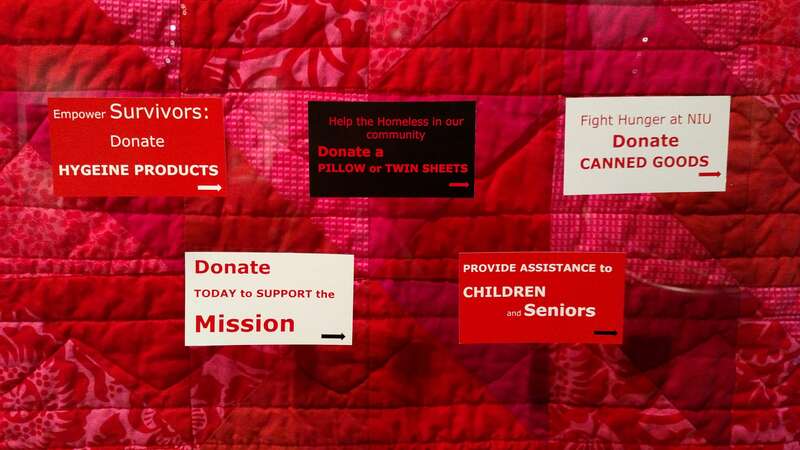 Visit the Museum’s “Quilts and Human Rights” exhibition, select your favorite Action Cards, and donate canned food, bedding and hygiene products, or show your support for children, seniors or indigenous communities in need. Nov. 28 is #GivingTuesday so kick it off by bringing your donation to the Museum’s front desk in Cole Hall. Whether it’s helping to fight hunger, aiding the homeless, empowering survivors of sexual assault and violence, assisting children and seniors, or supporting indigenous communities, visitors to the Pick Museum can make a difference this holiday season. “The Huskie Food Pantry supports 80 NIU students, on average, each week. We rely heavily on the generosity of donors and volunteers,” says Jill Zambito, director of Student Involvement and Leadership Development. 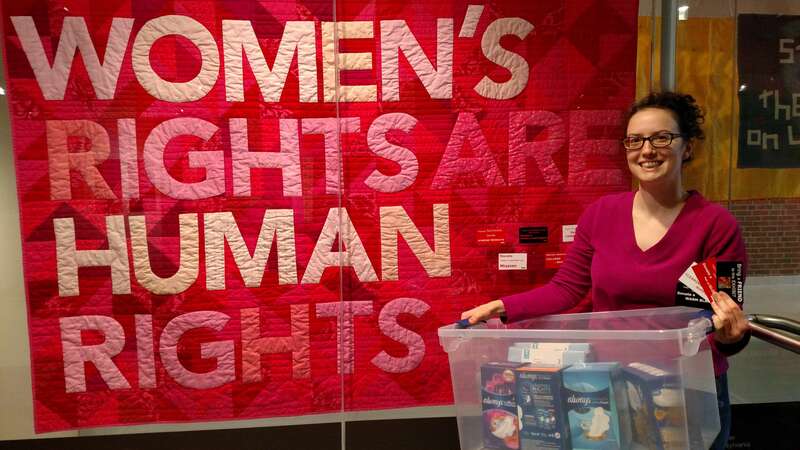 The Pick Museum’s Action Card Initiative is organized to coincide with the museum’s current exhibit, “Quilts and Human Rights”. Organized by the Michigan State University Museum, this exhibition includes over 40 quilts centered around themes of social justice honoring champions of human rights, documenting quiltmaking as a means of coping with oppression, and examining how quilts raise awareness of global social issues. The Pick Museum staff has expanded the exhibit by adding fifteen more quilts made between 2008 and today, highlighting the last decade’s booming modern quilting movement. The museum is open from 10 a.m. to 4 p.m. Tuesdays through Thursdays, and from 10 a.m. to 2 p.m. Fridays and Saturdays. Admission is free, and all are welcome. Come on your own or book a free guided tour by visiting the museum’s online tour reservation form. For more information, call 815-753-2011 or go to niu.edu/pick-museum/visit/programs-and-events/quilts-and-human-rights.shtml. The exhibit is made possible through the generous sponsorship of Cordogan, Clark and Associates Inc., and all exhibit programming is co-sponsored by NIU’s Center for the Study of Women, Gender and Sexuality and the NIU Graduate School.